Scrapyard Closes on N. American Street, Now What? 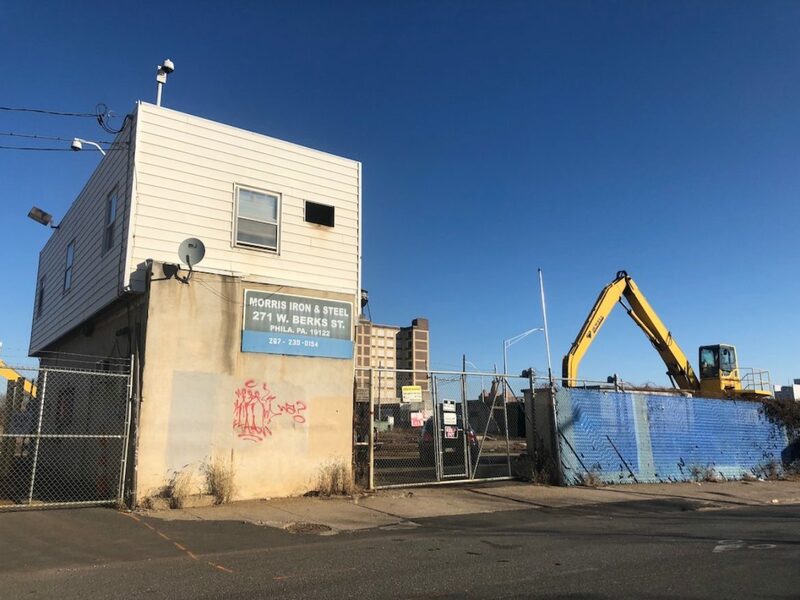 We can’t claim to remember the state of South Kensington back in the 1970s, but we have to think that the area around 265 W. Berks St. was quite downtrodden, such that a scrapyard appeared on this 3-acre property which had previously been used as a rail depot. While we can’t speak to the state of South Kensington from forty years ago, we’re intimately familiar with its current situation, booming with development and transforming in ways we wouldn’t have predicted even a few years ago. 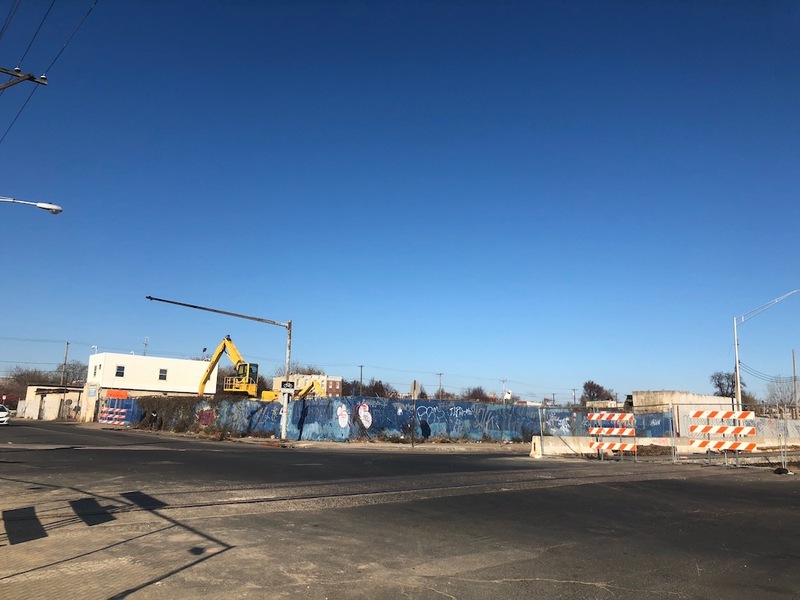 As the neighborhood’s population has continued to grow, we have to think that the continued presence of the scrapyard, operated by Morris Iron & Steel, has become less tenable for all parties involved. And so it’s with little surprise that we learned that the scrap yard closed down within the last few months. View from N. American St.
At this time, we don’t see any permits on public record regarding this property, nor do we see any indication that the property has changed hands. Thinking a development opportunity might be staring us in the face, we reached out to the former operators of the site, who still have a few other locations, to ask about whether someone has bought the property. Indeed, it seems someone has purchased the sizable parcel, though the receptionist at Morris didn’t have any idea who bought it or what they have in store for the site. We have some ideas, at least in terms of what we could see here. The property is zoned ICMX, which means that industrial and commercial uses are permitted by right, and any residential uses would require a zoning variance. 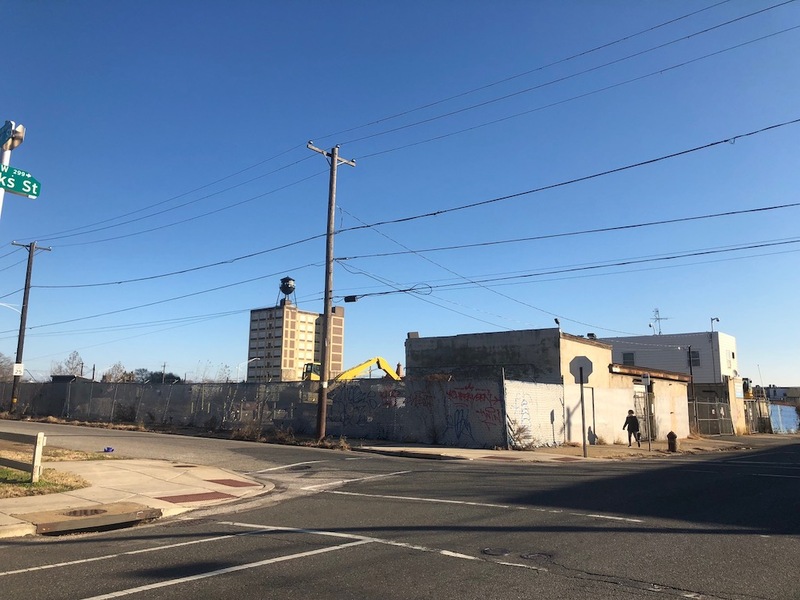 Though industrial uses are generally in a state of retreat from greater Center City neighborhoods, we have seen N. American Street maintain industrial businesses in recent years, even seeing new industrial/commercial buildings get built along the corridor. From what we can tell, the Planning Commission is interested in maintaining N. American Street as industrial, and would balk at supporting any variances that don’t maintain at least some kind of industrial uses. We’re just spitballing, but we have a feeling that we’ll see an industrial building get built here, eventually. A story on Philly.com just last week indicated strong growth in demand for new warehouse space in Philadelphia, with spaces being built without leases in place. A 3-acre site is probably just right for a smaller-sized project of this type, and the corridor still makes sense for this kind of development. On the other hand, we might see a developer go in the other direction, like a five-story mixed-use project with retail on the ground floor and apartments above. We’re skeptical of whether the ZBA would agree to such a plan, but someone still might give it a shot. Does anyone in the neighborhood have any more concrete idea of what’s coming here? Before anything moves forward at this site, we imagine there’s quite a bit of environmental work to do at this property. Surely there’s some remediating to be done after four decades of scrap storage and processing.